Calhoun and Peach County added another chapter in the newly-minted rivalry in the semifinals of the Class AAA bracket. In the rematch of the 2017 title game, which Calhoun won 10-6, Peach County walked away with a 22-7 victory following an insurance touchdown on an interception return by Justin Harris with :18 seconds left in the game. Peach County’s big and fast defense caused trouble for Calhoun throughout the night which—coupled with an injury to Calhoun’s power back Zach Fuller early in the game—forced Calhoun to adjust. The Trojans defense sacked Gray five times in the first half for losses of four, six, six, 10 and 14 yards as it took a 13-7 lead at the break. The defensive effort allowed the Trojans to hold Calhoun to -25 rushing yards in the first half while running 22 offensive plays. The Trojan defense blocked a deep Calhoun punt and recovered inside the Yellow Jacket six-yard line to set up an easy touchdown to start the scoring. Jamir Best made the play on the punt and recovered the ball to set up a touchdown run by quarterback Jaydon Gibson with 5:17 left in the first quarter. Calhoun answered following a Gavin Gray pass to Brannon Spector, which set up a first and goal at the Peach five-yard line. The Peach defense, looking like it could hold, forced Calhoun into a fourth and goal situation. Calhoun—as it did several times on the night—drew Peach County offsides, moving Calhoun a few inches closer to the end zone to allow Gray convert the short touchdown to tie the game at 7. Peach County took advantage of a Calhoun miscue as it bobbled the snap on a punt attempt. Peach County secured the ball and took a 13-7 lead on a 31-yard pass from Gibson to Justin Harris with 3:51 left in the first half. Calhoun’s defense blocked the ensuing extra point attempt. With 1:30 before the half, Peach County forced a crucial turnover to keep Calhoun from scoring even a field goal following a long run by Spector. Gray missed an open receiver on the right edge of the field before the fumble recovery by Quentel Jones on the ensuing play. Peach County extended the lead on a 31-yard field goal by Rene Galan with eight seconds left in the third quarter to take a 16-7 lead. The field goal was set up by a run by Gibson after he avoided tackles behind the line of scrimmage and turned it into a gain. Peach County is in the state championship game for the second-consecutive season since winning back-to-back titles in 2005-06 under head coach Rance Gillespie and taking the 2009 championship under coach Campbell. Peach will face second-ranked Cedar Grove in the final after the Saints moved past Pierce County 30-6 in its semifinal matchup. In a rematch of last year’s quarterfinal—which Colquitt County won in a tight 12-7 game—the Packers outlasted Archer once again 22-21 after one overtime on the strength of star kicker Ryan Fitzgerald and a blocked PAT after Archer’s OT touchdown. The Packers took the lead in overtime on a touchdown run from senior running back Ty Leggett. Fitzgerald, who hit four of five field goals in last year’s third-round game, including a 60-yard free kick field goal, went 5-for-5 with two over 50 yards and a 37-yarder to tie the game at 15-15 as time expired in regulation. Archer won the overtime coin toss and elected to play defense first. Colquitt County gave the ball to Leggett on first down for a gain of 6 yards to the 9-yard line, then Leggett dragged a crowd of Archer defenders into the end zone for a 9-yard touchdown run on second down. Fitzgerald’s extra point gave the Packers a 22-15 lead before Archer took the ball. Semaje Banks rushed on first down of the Tigers’ OT possession, fumbling the ball forward to the 6-yard line, where Archer covered the loose ball. Several plays after a holding penalty on the Colquitt secondary put the ball half the distance to the goal to the 3, Banks barreled into the end zone for a 3-yard score to bring the Tigers to within a point. But Camari Louis broke through the Archer line on the PAT attempt and managed a diving block, ending Archer’s hopes of reaching the second title game in school history. Archer took a 7-6 lead in the second quarter on an 18-yard touchdown pass from Carter Peevy to Andrew Dyer, and a 15-12 lead when Peevy ran for a 2-yard touchdown with 4:31 remaining in regulation. 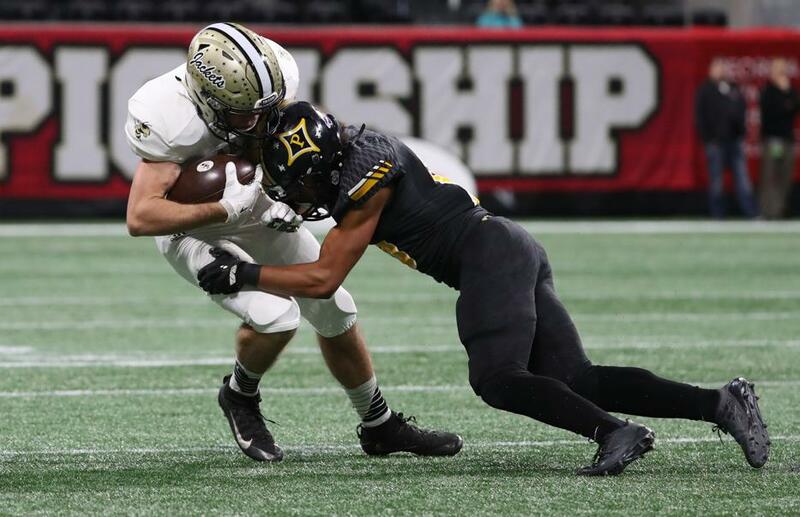 It will be Colquitt County’s fifth appearance in a state final in head coach Rush Propst’s 11 seasons at the school, and the Packers will try for their third title in that time frame—and fourth overall. The defending champion Lee County Trojans continued their tear through the Class AAAAAA playoffs, trouncing Lanier 42-7 behind a four-touchdown performance by Senior Shaundarious Kimbrough. After forcing a Lee County punt on the opening drive of the game, the wheels fell off for the Longhorns; they ended the opening frame with a muffed snap, a blocked punt and a red-zone fumble—all of which resulted in Lee County touchdowns. Kimbrough was first to score on a short run, followed by Zach Mason’s punt block and 25-yard touchdown return. Quarterback Kyle Toole escaped a mess of Longhorn defenders to convert for the first down, and the Trojans entered the second quarter with a 14-0 lead in Lanier territory. Kimbrough’s 1-yard wildcat run put the Trojans up three scores with 10:13 left in the half before Lanier got on the board with a 70-yard trip to the end zone by Taj Barnes. Lee County missed a 32-yard field goal, but Lanier couldn’t convert—turning the ball over on downs at the Lee County 36-yard line and allowing Kimbrough to score for the third time with 0:14 remaining in the half. After the teams traded punts to open the third quarter, Lanier again turned it over on downs, and Kimbrough capitalized with a 19-yard score for a 35-7 lead. Toole again evaded four defenders in the fourth to turn 3rd-and-long into a fresh set of downs, and completed a 15-yarder to Jeremiah Engram for the final points of the game. The Trojans—who have outscored their opponents 186-27 in the playoffs after a perfect season with a 424-37 margin of victory—will face Northside-Warner Robins in the championship game. The Warner Robins Demons are headed to the Class AAAAA championship after a win over the Rome Wolves. Rome struck first using a triple reverse as Knox Kadum connected with Xavier Roberts-Donaldson. A touchdown pass from Warner Robins quarterback Dylan Fromm to Tyler Fromm brought the score to 7-7 to end the first. Warner Robin’s Deondre Duehart recovered a Rome fumble which led to a 15-yard touchdown run by Ke’shawn Duvall. Rome tied the game 14-14 with 5:06 left in the second with a 1-yard rushing touchdown by Kadum, but Fromm connected with Marcayll Jones on a 25-yarder to give Warner Robins a 21-14 lead to end the half. Warner Robins took a 28-14 lead early in the third when Fromm found Devin Brown for a 20-yard touchdown. Rome then responded shortly after with two consecutive touchdowns—one by Kadum and the second by Jamious Griffin. A 16-yard touchdown by the Demons off a pass from Fromm to Jones brought the score to 35-28 in favor of Warner Robins to end the third. Warner Robins was able to seal the game in the fourth with a 31-yard field goal from Cary Payne III and a 2-yard rushing touchdown by Jahlen Rutherford. The Bainbridge Bearcats overcame a 13-0 fourth-quarter deficit in a 20-19 victory over host Stockbridge in a game that mirrored their roller-coaster regular season. After a 2-0 start, Bainbridge lost five of six games before defeating Harris County and Thomas County Central by a combined margin of 93-11 to finish 5-5. Coming off a 23-20 victory over Buford in the quarterfinals, Bainbridge looked poised to take an early lead with a drive midway through the opening frame that began in Stockbridge territory. A holding penalty negated a quick Bearcat touchdown before a penalty on Stockbridge gave Bainbridge a fresh set of downs. A fumble in the end zone resulted in a touchback, but Roman Harrison’s sack forced a Stockbridge punt to close the scoreless opening frame. After two big completions by Bainbridge quarterback Quayde Hawkins, the following three passes were dropped. The Bearcats faked a field goal attempt, but the Stockbridge defense didn’t bite, and Jevon McDonald gave Stockbridge a 6-0 lead with a touchdown pass to Kerick Reese with 1:33 in the opening frame (the PAT was blocked). Bainbridge had two third-quarter turnovers, a pass that was intercepted by the Tigers’ Jaylen Jackson and a fumble recovered by Jarvis Richardson deep in Bearcat territory. McDonald ran the ball in for a 13-0 lead with 10:54 to play, and Bainbridge looked to be in trouble after an illegal forward pass on the ensuing kickoff return placed the Bearcats all the way back at their own 5-yard line to begin their drive. Caleb McDowell finally put Bainbridge on the board at the 6:37 mark with a 7-yard run, and Aaron Spivie gave the Bearcats a 14-13 lead with an interception return just over a minute later. McDonald found Yahsyn McKee with a 19-yard touchdown pass to reclaim a 19-14 lead—the extra point was missed—with 1:52 to go, but the Bearcats recovered their own fumble on the kickoff return and took it to the house on a lateral for a 20-19 lead after the failed two-point conversion attempt. Stockbridge drove all the way to the Bainbridge 33-yard line but turned the ball over on downs, sealing the Bainbridge victory and the Bearcats’ first trip to the state championship since 1982. Host Cartersville went up 10-0 midway through the second quarter following a 26-yard Oscar Hernandez field goal and a 33-yard touchdown pass from Tee Webb to Devonte Ross, but Marist used two late first-half touchdowns to go up 14-10. The first War Eagles touchdown came on a Lincoln Parker goal line run with 1:20 left, and Jalen Clark strip-sacked Webb and returned it for a touchdown on Cartersville’s next offensive possession. The Purple Hurricanes’ game-winning touchdown came with 7:51 left, on a drive that was kept alive by a costly roughing the kicker penalty committed by Marist. Webb escaped the pressure and threw a 37-yard touchdown pass to Devonte Ross. Callaway was first on the board when Senior Hunter Williamson drained a 14-yard field goal to take the early 3-0 lead. With 1:44 left in the first, Rockmart’s Markus Smith dashed 4 yards into the end zone to give the Yellowjackets the lead. Before the quarter could come to a close, Callaway retook the lead off a 69-yard touchdown pass from Sophomore Demetrius Coleman to Junior Jacob Freeman to go up 10-7 heading into the second. Rockmart pushed out in front again following a 5-yard rushing score from Javin Whatley, but would quickly cough up the lead once Junior running back Cartavious Bigsby trotted 65-yards down the field and into the end zone to put the Cavaliers up 17-14 at the half. Rockmart kept the points coming in the third as Senior quarterback Dylan Bailey connected with Junior Reed Couch for a 27-yard touchdown. Callaway came within one point of the Yellowjackets following a field goal to close out the third, but an 8-yard rushing score from Whatley early in the fourth helped seal the deal on Rockmart’s semifinal victory. Callaway managed to rack up a safety with 5:52 left in the game but would fail to put points on the board again. Fitzgerald’s Kody Krause hit his man Damien Devine for a 25-yard touchdown to put the Purple Hurricane up early in the first. Heard County tied the game later in the quarter following a 5-yard rushing touchdown from Senior Alijah Huzzie. Late in the second, Devine struck again for Fitzgerald off a 1-yard rush into the end zone before capping off the drive by converting a 2-point conversion. With :45 left in the half, Heard County tied the game again when Senior Aaron Beasley rushed 2 yards into the end zone. The Braves converted the 2-point conversion to tie the game at 15-15 heading into halftime. On the first play of the second half, Huzzie exploded for a long 73-yard stretch downfield on his way to pay dirt. A missed PAT after the score left the door open for Fitzgerald who capitalized on the missed kick with a 31-yard touchdown pass from Krause to Sophomore Chances Green to take a 22-21 lead. With 4:28 left in the third, Heard County knocked in a 23-yard field goal to reclaim the small lead of 24-22 heading into the fourth. Fitzgerald’s Justin Reliford gave the Purple Hurricane the lead following a 1-yard rushing score and 2-point conversion, but the Braves were able to tie the game for the third time following a 3-yard rushing score from Beasley. Fitzgerald had a chance to claim the win with a 46-yard field goal to end the game but fell short on the kick to send the game to overtime. On Heard County’s first play in overtime, Beasley rushed 15-yards into the end zone to take the lead. Fitzgerald was unable to reach the end zone during their possession, giving the Braves the first shot at a football state title in school history. Junior Zach Smith kicked a 27-yard field goal as the first half expired to put Irwin County up 3-0. Jamorri opened the second half with a 74-yard kickoff return that set up teammate D.J. Lundy for a 7-yard touchdown run—increasing Irwin County’s lead to 10-0 with 9:50 left in the third. Pelham answered with a 13-play, 87-yard drive that Javoris Williams capped with a 1-yard score, but the subsequent PAT attempt was sent off the post to keep the deficit 10-6. Smith quarterbacked Irwin deep into Pelham territory on the ensuing drive and found Jamal Paulk for a 10-yard touchdown pass on a crucial fourth-and-six call that extended the Indians’ lead to 16-6. A Kam Ward interception set up Lundy for his second touchdown run of the game, and a Gabriel Benyard interception sealed the victory late in the fourth quarter. Clinch County took a 31-17 lead into the final quarter and held off the host Eagles to set up a rematch of last year’s championship game with Irwin County, in which the Panthers prevailed 21-12. Clinch County and Marion County traded touchdowns on their opening drives, and a Zack Robbins 31-yard field goal put the Panthers up 10-7 at the end of the first. Tyler Morehead grew Clinch County’s lead to 17-7 with a 30-yard touchdown run and Marion County added a field goal. Morehead threw a 55-yard touchdown pass to Jeremiah Johnson that made it 24-10, but Marion County answered with a score right before the half to keep it a one-possession affair (24-17). Senior Trezmen Marshall scored on a 55-yard touchdown run at the end of the third that put Clinch County out in front 31-17. The Athens Academy Spartans defeated the Prince Avenue Wolverines and are now headed to the Class AA state championship. The win came thanks to a strong rushing game bolstered by a fantastic performance from running back Len’neth Whitehead, who scored three out of the four Athens Academy touchdowns. The Spartans were on top 14-7 at the half after to a 1-yard rush from Whitehead in the first quarter and a 1-yard rush by Palmer Bush in the second. Prince Avenue quarterback Brock Vandagriff took it to the end zone for five yards early in the second quarter. Athens Academy was up 28-7 with 4:09 left in the game when Whitehead scored his third touchdown of the night. Vandagriff connected with Mack Simmons for a 29-yarder with 2:56 to go, and his 10-yard rushing touchdown with thirty-one seconds remaining put the score at 28-21. Athens Academy will face off against Eagles Landing Christian Academy in the state championship. The game will be a rematch of last year’s championship game. Savannah Christian Raiders running back Marquell Brown opened the game with a red zone touchdown run, but Eagles Landing didn’t flinch much after that. The visiting Chargers responded with a 24-yard touchdown run on a quarterback keeper from Brayden Rush. An Eagles Landing interception on the ensuing possession set Rush up to score again on a 12-yard run for a 14-7 lead. Not even 20 seconds later, Chargers linebacker Johnathan Youngblood intercepted the ball and returned it 46 yards for a touchdown to give Eagles Landing a 21-7 lead at the end of the first quarter. Rush scored his third touchdown of the night, a 91-yard option keeper, early in the second quarter. Eagles Landing scored again a few minutes later after another Youngblood interception set Chargers running back Keaton Mitchell to score his 46th touchdown of the year on a goal line run. Mitchell scored again on 18-yard touchdown run with less than two minutes to go in the first half to give Eagles Landing a commanding 49-7 lead at halftime. Savannah Country opened the second half with an onside kick that resulted in a touchdown a few plays later, but the Raiders offense and defense were no match for Eagles Landing’s firepower; the Chargers scored three more touchdowns—including an 80-yard score by senior Justin Menard—to propel them to an easy 70-21 road victory in the semifinals. Eagles Landing will play Athens Academy in the state championship at 10 a.m. on Wed., Dec. 12 at Mercedes-Benz Stadium. We work with the Atlanta Journal Constitution on Friday nights, and Cedar Grove was one of the four featured games that the AJC sent writers to for our collaborative semifinal coverage. We took the other 12 games for our roundup. In no way were we playing favorites and we will take this concern mindfully to look for possible solutions. We will make sure that links for the featured games are included in future posts as to ensure that our hard work does not appear biased. The AJC gives comprehensive coverage of all games and does a very detailed write-up of each matchup. This article makes NO MENTION at all of the Cedar Grove Saints, besides the fact that they are playing Peach County. –>”Peach will face second-ranked Cedar Grove in the final after the Saints moved past Pierce County 30-6 in its semifinal matchup.” <– It's sad. You all have at least a full paragraph wrap-up on EVERY OTHER semi-final matchup. The news didn't even cover any of the quarter or semi final games for Cedar Grove. It's ok though our boys will be ready to play at the Benz.